A starting line with a favored end opposite of where you want to go can throw a wrench in your plans, Quantum's Terry Hutchinson sorts out options when things get tough. If the race committee is smart, they may do this on purpose: skew the starting line ever so slightly so that the favored end of the line is opposite from the favored side of the course. It can be a good way to spread out the fleet, especially when the favored side of the course is fairly obvious. With some race committees this happens by accident. Either way, it presents a conundrum. Do you take the early advantage of the line bias, or sacrifice a boat length or two in the name of getting to the side you know will pay off in the long run? When the left side of the course is favored but the right (committee boat) end of the line is favored, there are two approaches. Get the best possible start at the weather end, but to the left side—to leeward—of the group that inevitably will bunch up at the committee boat. This is best set up by a port tack approach, allowing you the time to identify where the traffic is relative to the starboard layline for the boat end. Because of that weather-end bias, a well-timed approach will allow you to nicely tuck yourself in to leeward of the boat-end pack. Be careful with this start as being to leeward of the group means that you might have to push the line to keep your nose clean after the start. With a start a quarter of the way down from the committee boat, the boats to windward will give a slight bow-out look to the helmsman. The further you get from the biased end, the more difficult it will be to get that bow-out position, which is crucial since you really want to continue on starboard off the line, toward the favored side. Plan B is to own the choice spot at the weather end of the line. If you get away cleanly, you have a reasonable chance of winning the race. If your lane closes down or you don’t get off in the front row, you can utilize the advantage from the line bias to do two clearing tacks, and set yourself up to windward of the group going left. The determining factor here is having a good feel of the windward end bias and how hard you want to fight for it. Remember that only one or two boats will get away cleanly from the boat end of the line. Balancing the risk/reward of the situation is the trick. The start always feels harder when the situation is reversed, and the pin end is favored but you want to head to the right side of the first beat. The further away you are from the pin end, the more advanced the leeward boats will look because of the line bias. This is important to remember because if you judge your position on the line based on other boats you may find yourself over early. 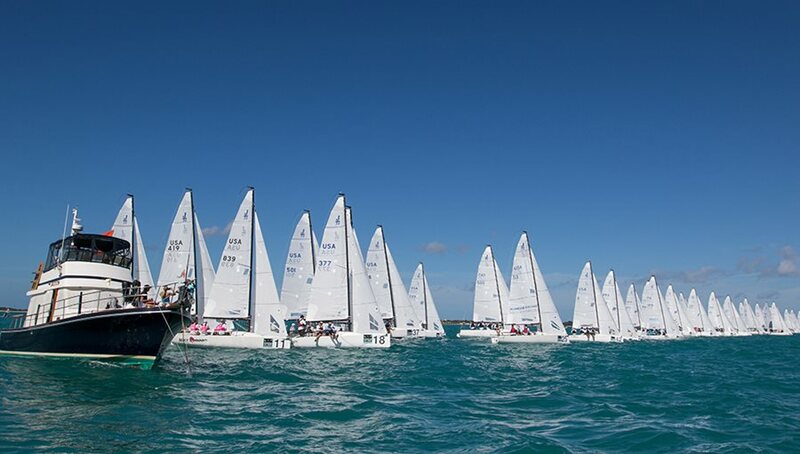 If the right side of the course is obviously favored, most boats are likely to tack onto port tack soon after the start. For a pin-end start to work, the bias needs to be significant enough that, after tacking to port, you are at least bow-to-bow with the boats to leeward. If they are farther advanced than bow-to-bow, you may find yourself getting squeezed and eventually being forced to tack away from the favored side. In most starting situations, the focus is on the boat to leeward, and carving out enough room to windward of that boat so you don’t fall into his disturbed air. In this scenario, however, it’s the boat to windward that may be the most troublesome since he’ll be the leeward boat once the fleet flops on to port to make for the favored right side. One other factor to consider when deciding how hard to push toward the pin end of the starting line is the length of the leg. For a short leg, the advantage of the line bias can be considered the first shift, and it may be worth fighting for. A longer leg allows for more time for the anticipated right-hand shift to take effect, and favoring the shift over the favored end of the starting line is often the best solution. This article orginally appeared on SailingWorld.com as a part of the Terry's Tips column.